Dehai News -- (Athletics Weekly) Kiptum smashed the 58:23 world record held by Eritrea’s Zersenay Tadese since 2010 after winning the Valencia Half Marathon on Sunday. (Athletics Weekly) Kiptum smashed the 58:23 world record held by Eritrea’s Zersenay Tadese since 2010 after winning the Valencia Half Marathon on Sunday. 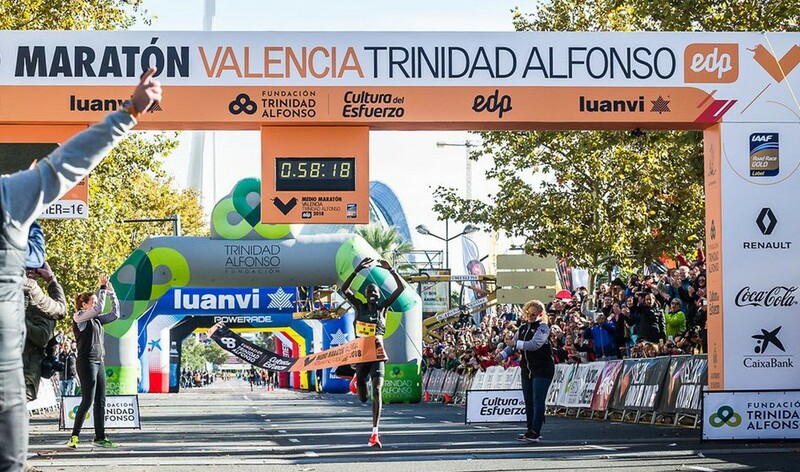 Kenya’s Abraham Kiptum stormed to a world half-marathon record at the Medio Maratón de Valencia Trinidad Alfonso on Sunday, clocking 58:18 to take five seconds off the previous global mark which had been set by Eritrea’s Zersenay Tadese in 2010. One year after his compatriot Joyciline Jepkosgei broke the women’s world record with her time of 64:51 at the same event, Kiptum also created history, improving his PB of 59:09 set just six weeks before in Copenhagen. The leaders went through 5km in 13:56 and 10km in 28:02 before Kiptum passed 15km in 41:37. Further creating a gap on his rivals, the Kenyan clocked 55:18 for 20km to also improve by three seconds Tadese’s world best set during his world half-marathon record run in Lisbon eight years ago. Kiptum continued on to stride over the finish line and straight into world record celebrations. Ethiopia’s Jemal Yimer was second in 58:31 to move to third on the world all-time list, while his compatriot Abadi Hadis finished third in 58:43. Britain’s Callum Hawkins was the top European athlete, placing 16th in 61:00 for the third-quickest half-marathon of his career. The women’s race was won by 2015 world 10,000m silver medallist Gelete Burka in 66:11 as the Ethiopian further demonstrated her impressive range, claiming victory in the same city where she won the world indoor 1500m title a decade ago. Alia Mohammed Saeed of United Arab Emirates was second in a national record of 66:13, while Kenya’s Edith Chelimo was third in 66:18. Abraham Kiptum of Kenya set a world record when he ran the Valencia Half Marathon in 58 minutes, 18 seconds Sunday. "I can't believe it. I'm over the moon," said Kiptum, 29. "Obviously I knew I was in good shape because I set a [personal best] last month in Copenhagen, but I was eager to run in Valencia because it's one of the flattest circuits I've ever run and I was confident of improving on my best." Kiptum bested the previous record of 58:23 set by Zersenay Tadese of Eritrea in 2010. Sunday's run was 51 seconds faster than Kiptum's 59:09 in Copenhagen in September. Gelete Burka won the women's race in 1:06:11.